David Russell is currently President of Philanthropology, LLC. Previously, Russell was Vice President of External Affairs at Verizon where he was responsible for directing all external communications, charitable contributions, community involvement and economic development activities by Verizon for 11 states in the central U.S. He began his corporate career in 1982. Russell held various public affairs management positions before being named a director with Verizon’s national Telephone Operations group in 1988. Russell later served as national media spokesman for telephone operations and in 1994 he became the regional vice president of public affairs for Texas and New Mexico. He assumed his current duties in the year 2000. Before joining Verizon, Russell was a daily newspaper editor and is a member of the Society of Professional Journalists, the International Association of Business Communicators and the Texas Public Relations Association. He is also a past-president of the Press Club of Dallas. Russell was named “Man of the Year” in 2011 by SafeHaven of Tarrant County for his work in the prevention of domestic violence and was named a 2009 “Champion of Literacy” by Literacy Instruction for Texas, the region’s largest literacy provider. Also in 2009 he was appointed to serve on the Texas Literacy Council to help develop a statewide action plan by 2012 for the improvement of literacy in Texas. 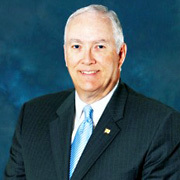 He is immediate past-Chairman of the Texas Independent College Foundation and the Business Council for the Arts. He is a former Chairman of the North Texas Commission, the Texas Education Reform Caucus, the Texas Business and Education Coalition and the Keller Chamber of Commerce. He also serves on the boards of the Texas Telephone Association Foundation, the Dallas County Community College District Foundation, the DFW Metroplex Salvation Army Advisory Board, and is a member of the Dallas Citizens Council. Russell received his BA degree from the University of Arkansas, his MBA degree from the University of Dallas and he has been named an honorary alumnus of the University of North Texas. He and his wife Debbie have two grown sons and live in Keller, Texas.